The following figures are drawn on a squared paper. Count the number of squares enclosed by each figure and find its area, taking the area of each square as 1 cm2. 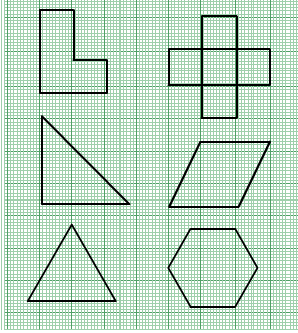 (i) There are 16 complete squares in the given shape. (ii) There are 36 complete squares in the given shape. (iii) There are 15 complete and 6 half squares in the given shape. (iv) There are 20 complete and 8 half squares in the given shape. (v) There are 13 complete squares, 8 more than half squares and 7 less than half squares in the given shape. (vi) There are 8 complete squares, 6 more than half squares and 4 less than half squares in the given shape. On a squared paper, draw (i) a rectangle, (ii) a triangle, (iii) any irregular closed figure, Find approximate area of each by counting the number of squares complete, more than half and exactly half. (i) A rectangle: This contains 18 complete squares. Then the area o this rectangle will be 18 cm2. 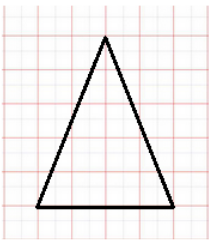 (ii) A triangle: This triangle contains 4 complete squares, 6 more than half squares and 6 less than half squares. (iii) Any irregular figure: This figure consists of 10 complete squares, 1 exactly half square, 7 more than half squares and 6 less than half squares. 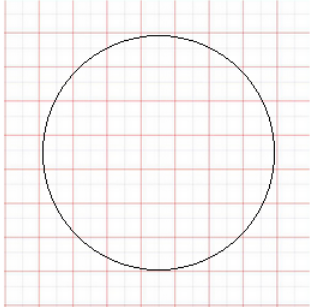 Draw any circle on the graph paper, Count the squares and use them to estimate the area the area of the circular region. This circle on the squared paper consists of 21 complete squares, 15 more than half squares and 8 less than half squares. Let us assume that the area of 1 square is 1 cm2. Using tracing paper, we traced both the figures on a graph paper. This figure contains 8 complete squares, 11 more than half squares and 10 less than half squares. 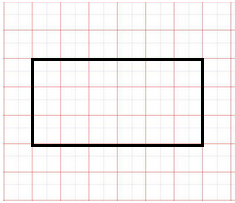 Let us assume that the area of one square is 1 cm2. 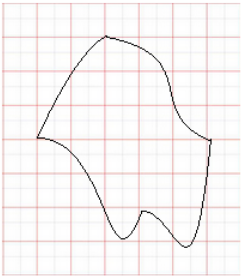 On comparing the areas of these two shapes, we get that the area of Fig. (ii) is more than that of Fig. (i).